Children receive treatment at a hospital after eating a free meal at a primary school in Chhapra district in India's Bihar state. PATNA, India - At least 20 children died and dozens were taken to hospital with apparent food poisoning after eating a meal provided for free at their school in the Indian state of Bihar. Police said the children, aged eight to 11, fell ill after consuming a lunch of rice, soybean and legumes on Tuesday. The school provided free meals under the Mid-Day Meal Scheme, which involves 120 million children. "As soon as my boy returned from school, we rushed to the hospital with him. He was vomiting and he said his stomach was aching," said Raja Yadav, the father of one victim. Education minister M.M. Pallam Raju said a school cook had also died. The initial death toll of eight shot up to 20 on Wednesday. The exact cause of the deaths will be known only after the post-mortem examinations and food sample tests, doctors and state officials said. Dozens of residents took to the streets in Chapra, pelting a police station with stones and setting ablaze buses and other vehicles, television channels showed. 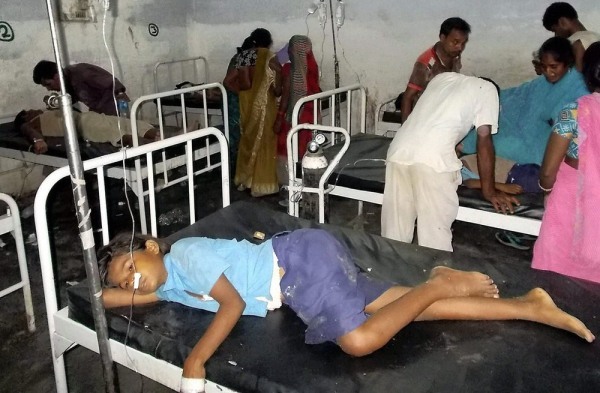 "We are currently treating 27 children here," said R.K. Singh, medical superintendent at the children's hospital in the state capital, Patna. "Of them nine are in serious condition, 18 are stable." Bihar Chief Minister Nitish Kumar has ordered an inquiry into the incident and has offered 200,000 rupees ($3,400) to the families of those who have died, the state's food minister said. Bihar is one of the most impoverished states in India, according to government data.